The trio of Sean Powter, Brian Hurley and Matthew Taylor are on the Cork injury list. CORK FORWARD BRIAN Hurley will undergo a scan to determine the nature of the injury he suffered yesterday to the same hamstring that he has previously required two operations on. The luckless Hurley ripped his hamstring off the bone during a Cork senior training session in June 2016 before a recurrence of the severe injury occurred in March 2017 when in action in a league game for his club Castlehaven. He returned to action for Cork last summer, scoring a point off the bench in their Munster semi-final win over Tipperary, and has featured in this spring’s league. The 26-year-old scored two early goals from play in yesterday’s match in the Athletic Grounds before being forced off in the 48th minute. Cork defeated Armagh 3-9 to 1-14 but ultimately suffered relegation to Division 3 due to Clare’s win over Tipperary. Cork’s other injury concerns look likely to ease before they start their championship campaign with a Munster semi-final tie in Páirc Uí Chaoimh against Tipperary or Limerick. Sean Powter was withdrawn before the game due to a mild muscle strain but it was not linked to his previous hamstring injury suffered in January 2018 in a league tie against Tipperary. Powter was due to start for Cork for the first time in 14 months yesterday after having made his comeback in recent weeks with substitute appearances. Michael Hurley (quad) was also ruled out before throw-in having been named to start in the Cork attack but his injury is regarded as a minor one. Matthew Taylor (AC joint) and John O’Rourke (hamstring) both had to be withdrawn by half-time of yesterday’s game but neither injury is thought to be serious. 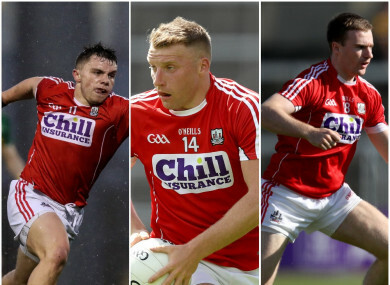 Goalkeeper Micheál Martin (groin), defender Liam O’Donovan (knee) and forward Luke Connolly (quad) were all absent for Cork’s final league fixture but are expected to return to action over the next month. Email “Hurley set for scan on hamstring as Cork injury list grows after league relegation”. Feedback on “Hurley set for scan on hamstring as Cork injury list grows after league relegation”.